One of the most common misconceptions about lawn care is that you can't install a Tucson sod lawn in the fall because it's too cold for grass to grow. Arizona doesn't see the insanely cold temperatures and snow storms of the East Coast, so it's completely acceptable to have a fresh Tucson sod lawn installed in autumn. In fact, spring and autumn are the two best seasons to lay sod in Tucson because the rain and cool temperatures help sod quickly root. Your first winter with Tucson sod plays a major role in how well it establishes a healthy root system needed for a beautiful green lawn. 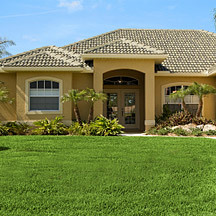 It's important to tend to your new sod properly in the fall, so that it grows strong during the cooler winter months and thrives through spring and summer. 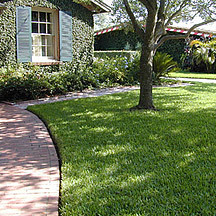 *	Rake the Tucson sod to remove any debris including leaves and branches that may have fallen. Having too many leaves on your lawn prevents the grass from being able to get sunlight and breathe properly, and can also lead to insect infestations and other lawn diseases. Be careful when raking to make sure you don't pull up the sod from the soil! Since it has been freshly installed it will be easy to pull up if you are raking too aggressively. *	Gradually lower your mowing blade during the fall months until they are at about 1 inch tall. *	Once your lawn has been in for at least six weeks, apply a winter fertilizer with slow-release nitrogen in November if possible. 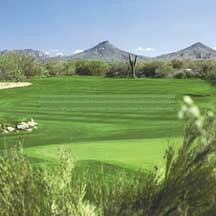 This will help make sure your Tucson sod is fed enough nutrients during the winter and through the spring. *	Monitor your moisture levels and water as needed, so that your lawn and the underlying soil is moist at least 4 inches into the ground. *	Make sure you're installing the sod in autumn to avoid the scorching temperature of late summer which can easily fry your lawn if you're not careful. Sod can take as many as two years to mature fully depending on the type you choose, so year-round care is needed if you want to have a beautiful lawn. Sign up for our seasonal newsletter to get lawn care tips straight from the pros. 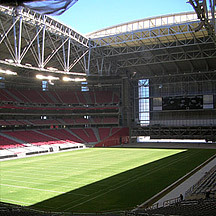 Got any specific questions on how to care for your sod lawn in Arizona? Give us a call at 480.456.1199, come down to our showroom, or visit our website at www.evergreenturf.com.